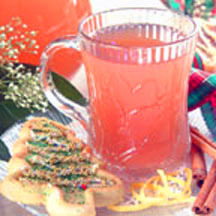 A delicious, non-alcoholic warm punch for holiday entertaining. In a large pot, combine apple juice, pineapple juice, cranberry juice, lemon peel, cinnamon stick and nutmeg. Bring to a boil, reduce heat and simmer for 10 minutes. Strain and serve warm. *Peel lemon with a vegetable peeler, making sure not to get any of the pith (white part). Save fruit for another use. Cut peel into 1/2-inch slices.